iPod Splitter - iPod cable - ipod wire. iPod cable - ipod wire - ipod splitter. 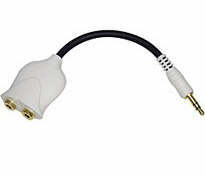 Y-adapter connects two 3.5mm stereo jacks to one 3.5mm stereo plug Allows two people to listen at once by connecting two headphones to your iPod Works with any standard headphone jack. iPod Nano, iPod Video 30 GB or 60GB.